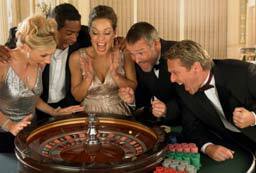 The roulette has only two betting options available, the Inside and Outside bets. A straight bet or classic bet is when you place your bets through speculation. The odds on winning straight bets are very slim, this betting option remains a favorite due to the high payouts made per win, you can make 35 times more on whatever amount of bet placed. You can make 17 time on bets placed on a line that is between two numbers, it gives you a chance to of winning if the ball falls on any of the two numbers. This kind of betting is called split bet or two numbers. Square bet also known as Four number bet, just like the name suggests you get 8 times more on any bet amount placed if the ball rests on any of the four numbers. Five number bet involves 5 numbers and the payout is usually 6 time of your betting amount. However this is a poor bet that should be totally avoided. Outside bets are bets placed on numbers that do not belong to the framework of numbers on the spin wheel. They are numbers on the other end of the betting table. High Bet is when you place bets chancing that the ball will sit on numbers between 19 and 36 in the next spin. You get a payout that equals the amount of the betting chips placed. Low Bet is when bets are place on chancing that the ball will land on numbers between 1 and 18 on the next spin. The payout is the same as the one on high bets. Dozen bet requires that you place betting chips on a dozen numbers; the table is divided into 3 groups of number 1-12, 3-24, and 25-36 hence attracts a payout twice the amount of your betting chips placed. A column bet has a payout similar to the Dozen bet. You bet however is on the chance that one of the numbers in a column will hit. This option has a provision on the other side of the table with betting options. A column consist of 3 the top, middle and bottom numbers.